Each ml contains Polyethylene Glycol 400 BP 4 mg & Propylene Glycol BP 3 mg.
Filtear contains Polyethylene Glycol 400 (0. 4%) & Propylene Glycol (0. 3%). Polyethylene Glycol 400 (0. 4%) & Propylene Glycol (0. 3%) are eye lubricants. Eye lubricants keep the eye moist, help to protect the eye from injury and infection, and decrease symptoms of dry eye such as burning, irritation and feeling as if something is in the eye. It is scientifically formulated to shield eyes from dry eye discomfort so that eyes feel moist and refreshed longer. 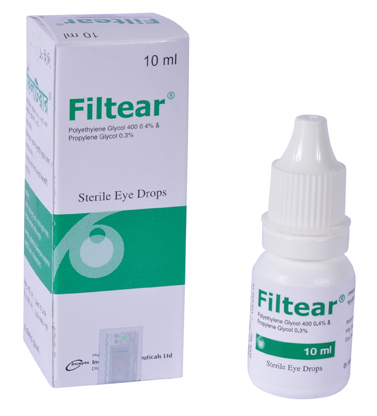 It is indicated for the temporary relief of burning and irritation due to dry eye. For Adults and Children: Instill 1 or 2 drops in the affected eye(s) as needed. Generally well tolerated. A very serious allergic reaction to this drug is rare. It should not be used if allergic condition occurs to any ingredients of the product.